I do not envy anyone trying to run a Government. The dilemmas are endless. How do you get the budget back in the black, while maintaining economic growth, supporting real wages growth, providing tax relief, building infrastructure, funding schools, hospitals, aged care and welfare? All the while keeping an eye on the next election and mollifying the chorus of stakeholders and lobby groups working to protect their interests. The call on government finances is infinite. Government income is not. Ensuring that scarce public funding is directed where it is most needed is a massive challenge. And individual voting taxpayers ask themselves similar questions. Am I happy for my taxes to be used to reduce the waiting time for my elderly neighbour to get a hip replacement? Absolutely. Am I happy for my taxes to be used to ensure my local high school provides a high-quality education for all students? Definitely. Am I happy for my taxes to be used to subsidise the school fees for a wealthy family that can afford a medium or high-fee non-government school, but thinks their child is entitled to attend a low-fee school regardless? Probably not. For much of its history, Commonwealth school funding for non-government schools has at least in theory, been based on various measures of relative ‘need’. However, again for most of its history, the various measures of need have not been consistently applied across non-government schools, which has contributed to the ongoing “school funding wars”. One high profile provider of non-government schooling in Australia, the Catholic sector, has successfully argued for decades that the allocation of Commonwealth school funding based on need should not apply to them. This argument has hinged on the fact that this sector seeks to be a low fee education provider regardless of the demographics of the school communities they serve. 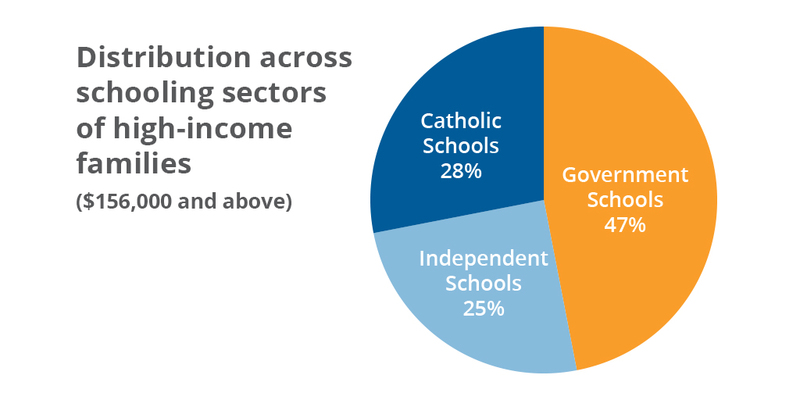 Clearly both Catholic and Independent schools serve some low SES communities. But both Independent and Catholic schools also serve some high SES communities as well. Why should only one sector be allowed to “choose” to be low fee and have that choice subsidised by taxpayers’ funds, when the other sector cannot choose to be low fee but must be funded according to the SES demographics of the school community? For an Independent school serving a higher SES community with a greater capacity to contribute to fees, the level of Commonwealth support per student is very low. If it is an Independent school serving a lower SES community with little capacity to contribute to fees, the level of Commonwealth support is higher. Many high and medium fee schools in the Independent sector would, given the opportunity, also choose to be low fee and have their fees subsidised to a high level by the taxpayer as well. If one religion can choose to be low fee, then why shouldn’t any school community, regardless of their religion or educational philosophy also choose to be low fee? It is not clear why one non-government provider can successfully demand that they are entitled to have their fees extensively subsidised by Australian taxpayers regardless of parents’ capacity to contribute to fees, while the Independent sector’s taxpayer support is subject to an assessment of relative need. Indeed, were all the schools in the Independent sector that wished to be low fee to demand the same level of taxpayer subsidisation as Catholic schools, the impost on government outlays would be overwhelming. However, the Independent sector is not demanding huge additional outlays of Commonwealth taxpayer subsidies for Independent schools. The Independent sector supports the application of an assessment of need for non-government schools. The Independent sector does not however consider that scarce taxpayer funds should be used to subsidise the fees of schools that “choose” to be low fee utilising a sectarian argument, but rather that the only schools that should be subsidised to be low fee are those schools serving low SES communities. Policy developers should consider the best use of scarce taxpayer funds when considering their school policies going forward. Surely funding to all non-government schools should be based on need.